nevard111228_bachmann3F_DSC_0671b_WEB, a photo by nevardmedia on Flickr. 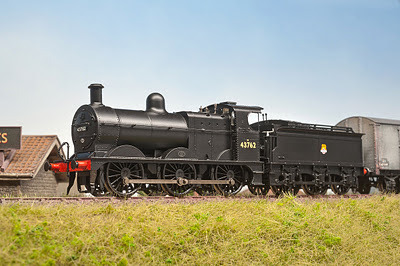 The new Bachmann 3F you may recall from before Christmas, has now received its final session of weathering after a renumbering to Templecombe's 43216. I tend to weather engines in stages, breaking for a day to two to appraise the effect under the layout's lighting and how it looks in relation to the layout and other stock. I like to get a uniform but not necessarily totally even look between engines and other items of rolling stock so nothing stands out too much. After looking at several colour photographs of this particular engine on the former SDJR I noticed that the smokebox area was frequently rusty, probably due to excessive heat effecting the paint. Apart from that, they had a slightly oily sticky appearance which would have attracted soot and grime. "Imagine Christmas Pudding smeared all over the engine rather than Barry Scrapyard" I recall somebody many years ago saying down a railway club. This is a good looking engine, especially now a bit of fake patina really highlights the fine detail. But one thing I hadn't really noticed until last night when weathering the tender frames, was the crazy positioning of the tender brake shoes, despite reading about them but obviously not taking on board the recent excellent Model Rail review on this very subject. If you click on the link below to bring up a bigger photo, it's very obvious that the brake shoes are flush with the tender frame sides and nowhere near the wheels. They're so far out that I'm sure sure even if it was regauged to Irish broad gauge they wouldn't be anywhere near! As yet I haven't done anything about this, but now the weathering tends to highlight the flaw even more so, in due I'll be ordering some bits from one of the plethora of men-in-shed-suppliers to address what I'm hoping will just be a matter of cutting the shoes away and replacing with some brass or white metal bits. 'After working the empty return trip from Bath Green Park Goods down to the sidings at Brewhouse Quay, we see Templecombe's 43216 resting before the fully loaded return trip. This trip, the last of the day was always popular with certain crews if near the end of shift (Drivers mainly!) because it left at 7.15pm which allowed for a few pints in the nearby brewery tap bar; the fireman was then given the dubious honour of driving the loco back to Bath Goods! nevard_111225_BQ_DSC_0545_WEB, a photo by nevardmedia on Flickr. When I took this photo around 0600 this morning, I quickly came to the conclusion that if a Christmas Pudding or Plum Pudding was a loco it would be a Beattie Well Tank, compact, un-athletic, well rounded, rich and oozing in character. I hope you'll agree with me that it looks perfectly at home tootling about the sidings on Brewhouse Quay, so much so that history has been re-written, well in Nevardland anyway! Imagine if when the delightful locomotives left Wadebridge shed for the last time in the early 1960's, that one of them at least was whisked up to Bath to operate the tight curvy brewery sidings, an ideal task for a design which spent much of its life on the windy and curvy Wenford Bridge line. The loco would not only shunt the brewery rail-network, but would also perform the occasional trip working from the brewery to Bath Green Park goods. nevard111223_bachmann3F_DSC_0529_WEB, a photo by nevardmedia on Flickr. 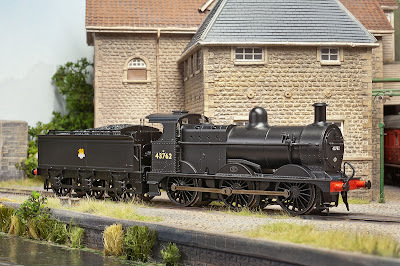 Bachmann Midland 3F weathered and renumbered as Templecombe's 43216. 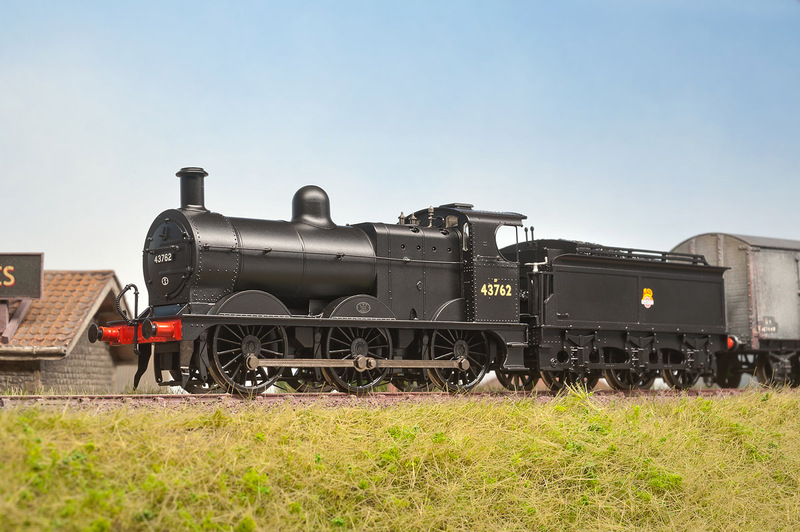 This loco was the 3F allocated to the former Somerset & Dorset line and was withdrawn in 1962. For photographers, this was taken on a mid-1960's Nikkor-S (Ai converted) 35mm f2.8 wide angle lens on a somewhat newer Nikon D700 digital body. 2 sec, f16, Adobe RAW/CS5 using the layout's own lighting. The only digital post production apart from basic level adjustment during the RAW conversion is the addition of fake smoke. To find out a few secrets of Brewhouse Quay, click on the above photo to take you through to another photo, then float your cursor over the image for detail notes. 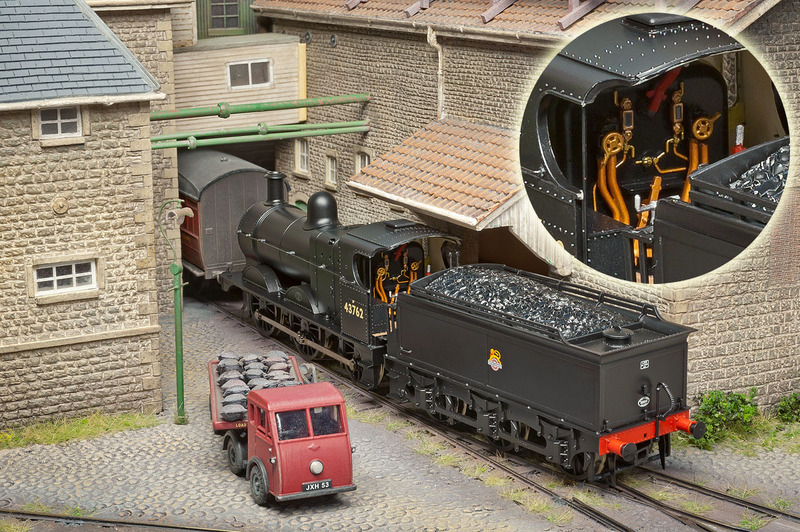 The recently released Bachmann Midland 3F arrived yesterday, and I must say that first impressions are that it's rather splendid. I'm not going to dwell on accuracy and suchlike, that I'm sure will be debated for the next 25 years on model railway forums, and anyway for the real truth there's a cracking review in December 2011 Model Rail (163) by people who really know what they're writing about - so get that back-issue of you're not already a subscriber. Instead my two pennies worth will be a few snaps to hopefully show the little beastie from from different angles to those already seen. Just click on the images below for a BIGGER view. Looking down (the layout is Brewhouse Quay), and it's very apparent just how good the cab detail is. The coal load is cast and actually loose, so if you want to replace it with real coal and to keep the weight a strip of lead might need to go in its place, though actually if you're happy with a full load, a layer of coal sprinkled on to PVA should work. Side view showing the compact nature which is rather like a 4F but squashed. The compact nature of this delightful loco makes it ideal for small layouts like this which normally only receive tank locos. It runs nicely too, and the wheel back to backs didn't need any tweaking to get them to run through the code 55 handbuilt finescale track here. Another side-view, but this time from the other side showing the gubbins on the side of the boiler. I'm no rivet counter, but what's depicted does look rather good, I'm not going to count them for you though. 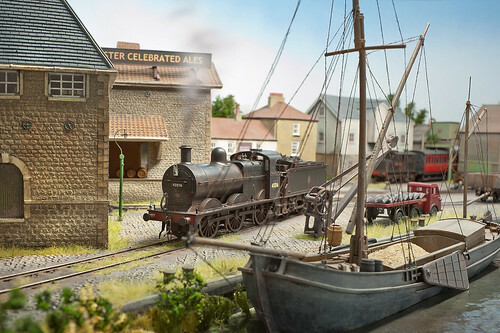 Flying across the rooftops, no I haven't rebuilt Brewhouse Quay, but simply placed my stock-photo-thingy on top of the wharf to take advantage of the layout's built in lighting. The eagle-eyed will notice that the cross-member has become detached from the brake hangers at the front, easily popped back in to place - the result of me being too eager to snap the engine after taking it out of the box without checking it over first. Next I have to pluck up courage to renumber and weather it up! xmascard2011_WEB, a photo by nevardmedia on Flickr. I hope that Father Christmas brings your the model train you want. 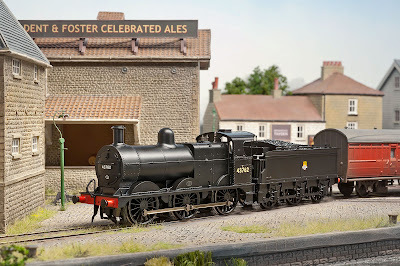 Looking to 2012 and that all important new year's resolution; if you're an armchair modeller, you will finally build that layout. If you're a modeller, you will finish that project and start a new one! Above all though, have fun and don't pay any attention to anything I say! 111216_rydes-hill_DSC_0157_WEB, a photo by nevardmedia on Flickr. As a model maker of mostly historical scenarios, I'm always on the look out for bits of 'olde England' to record for posterity to aid model making. 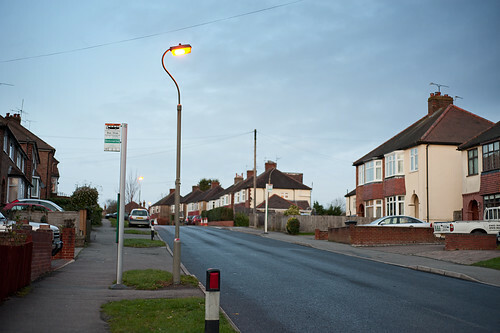 Currently in Surrey, older street lighting is being updated with new low energy systems which can be controlled and monitored from a central remote point, the outcome being that power will be saved and failed lighting easily pin-pointed. In residential areas like the above in Guildford the familiar rich orange coloured low pressure sodium lights (known by lighting aficionados as SOX) are being replaced with white flourescent lamps, and on busier roads, pink high pressure sodium lamps (SON) are rapidly taking over due to a longer life and a slightly less overpowering monochromatic effect on colours. Sadly though it's not just a case of replacing the bulbs and control gear because many of the columns are suffering from internal corrosion and could be a danger hazard. This means that lights like the above are repidly becoming a thing of the past, with Rydes Hill in Guildford being one of the few roads left with these 1960's Stewart & Lloyd lights as I type this. When the above Corby manufactured lights were new, they would have probably had mercury vapour lamps emitting that familiar blue-green glow which would have been replaced with the 35w sodium lamps seen here in more recent times. Whilst it's sad to see these lights go, environmentally the newer 'white' lighting in residential areas does make for a more pleasant experience, like many I've never liked that sodium glow that works past any gaps in the bedroom curtains. As the orange sodium-polluted sky gets replaced with a soft whitish-green hue in the side roads, in a funny kind of way the effect is quite retro and must be more like those night-skies of the 1950's when mercury and tungsten mostly lit the way. Forums, the web, mags and green nonsense. nevard_110731_BQ_IMG_0666_WEB800, a photo by nevardmedia on Flickr. The internet came along and changed everything, with all age-groups embracing the possibilities it bought. There can be few things in western society that the internet has not infiltrated, whether it’s shopping, banking, watching tv, gaming, research or simply uploading photos of drunken parties onto social media sites. For me, internet hobby-forums are a great way to see what other model makers are up, what’s hot and what’s not. It’s also a great social tool for like-minded nutters like me, and since re-joining this hobby a decade or so ago. I imagine that 95% of all the modellers I now know in the real world I had first contact with via the internet. 15 years ago, such was looked at as being slightly odd, possibly because in those days those ‘online’ were frequently socially challenged computer types – not always though, but mostly! 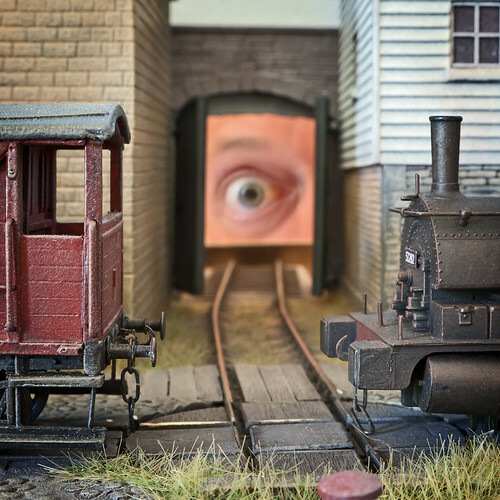 Mix that up with toy trains and you really were entering Jimmy-no-Mates land, that underworld of smelly types in sheds, multi-coloured biros, bad breath, GWR green enamel under the finger nails, infrequent changes of underwear, a bath tub full of Lima boxes and overly well organised tidy notebooks. We all know this hobby doesn’t have the best of image, but interestingly the guys doing the really great model making are sound upstanding members of society, not the odd-balls often seen trolling around shows with that fruity-aroma in tow (they’re mostly collectors I gather). The smart ones tend to keep their passion private and away from their professional lives where they could be ridiculed unless they have the character to carry it off of course! Like many hobbyists I'm not in a local railway club, possibly because what I see in the clubroom around the corner doesn't really inspire me, so would rather spend time working on my own projects. And anyway, when it comes to toy trains, I’m a bit of a control freak and would almost certainly snap at those who don’t know which end of the tube the glue comes out of (as it ends up all over my latest wagon). Luckily several times a month I get to travel the country to see other modeller's layouts up close through a lens (and over several cups of tea), so that takes care of my yearning to see other people's fabulous modelling first hand, but without having to share glue with people who stick their fingers together. Traditionally the printed hobby-magazine prior to the web was the only platform to share modelling with a greater audience beyond that of a club open day or exhibition. But now, the internet, or more specifically forums are changing the way that magazines used to work, in the future magazines will probably have less emphasis on breaking news to become of more of a showcase for classy layouts and modelling professionally photographed, written and presented. I might be wrong of course, but with the ability of the internet to transmit breaking news globally at an instant, manufacturers clamouring for pole position increasingly will rely on the web as the first port of call to introduce their new wares. Some will say that the bell tolls warning the end of traditional paper media, but I think that there will always be a demand for something that doesn't need batteries. For many, large volumes of text are easier to read printed on paper than on a computer screen - though maybe that's just me? When photography was invented they said that painting was dead, when TV was invented they said that film was dead. Nonsense of course! But I do think with all these extra ways to get our fix (or is it distraction?) less model making takes place these days because there still are only 24 hours in the day, the likes of Hornby & Bachmann know this of course, and will happily swap some of your salary for an increasing arsenal of ready-made bits and pieces to save the modeller time ultimately turning us all into collectors. In this increasingly ‘green’ society we live in, I always find it fascinating that we have a hunger for electricity that is far greater now that it was just a decade ago. When you’ve finished reading your paper book or magazine you can recycle it into egg cartons or newspaper and a new tree can be grown. On the other hand electronic display devices are costly to make, use many toxic materials, cannot really be recycled to any real degree and require bigger and bigger power stations to produce all the electricity to manufacture and power the devices. Rounding up on a positive note, we have more choice than ever before with electronic and printed media living side by side, with some model railway magazines unlike their other paper stable mates covering other subjects are actually increasing their sales! Of course there will always be those that favour one media form over another, so now there is something for everyone which is always a good thing. Me? I love the web for its immediacy in getting information across and being able to communicate and share the hobby with like-minded souls, but nothing will beat the proper printed page to appreciate a good model railway properly photographed, short of seeing it for real of course, but I would say that wouldn’t I? 111205_polbrock_IMG_2125_WEB, a photo by nevardmedia on Flickr. The Pedant & Armchair is now fully open and is complete with appropriate signage on the front. The nearby railway also has warnings to warn of its presence, but of the course the clientele would never dream of wandering onto the line because they almost certainly read government health and safety guides before going to bed. They are also unlikely to be drunk, 'mother' would never allow it. I just need to think of a suitable name for the licensee to post above the door, thoughts? Thanks to Troels Kirk for the inspiration. Beattie Well Tank No. 30587 trundles through the open crossing at Polbrook with a freight from Wenfordbridge to Wadebridge on a sultry summer day in 1957. 111204_polbrock_IMG_2088_WEB, a photo by nevardmedia on Flickr. "She smells a bit but has a heart of gold", as coined by John Cleese when introducing his slightly less than fresh wife at a drinks party on a well known Monty Python sketch. My method is to brush on a sludge of water based black acrylic and weathering powders, then wipe most of it of. These locos were generally quite well kept, so to reflect much use of an oily rag to give a nice sheen, Humbrol Metalcote was drybrushed on here and there to give a metallic oily look. To complete the effect, three link couplings have also been added, though I have still to remove the socket under the buffer beam used for the supplied tension lock couplings. I have also added one of the supplied distinctive Southern Railway route disks that sits just in front of the chimney. Bigger version of the above photo HERE!